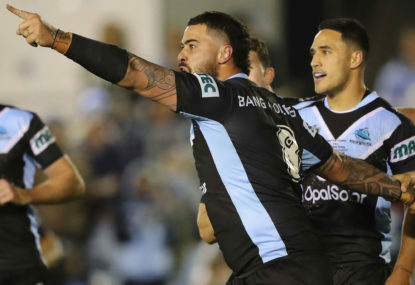 In an emotion-charged night at Cronulla, Fifita burst over the line with 13 minutes to go after spending half the game on the bench having earlier given away a penalty in the lead up to a Cowboys try. The brutal four-pointer broke a 12-12 deadlock and gave the Sharks the lead. The big prop then sprang to his feet, pointed and angrily yelled at the home side’s coaching box. But with the Sharks up 18-12, the drama wasn’t over as North Queensland’s Gavin Cooper moments later crossed in the left corner to give Thurston a chance to level the scores with seven minutes to play. Unlike his final State of Origin game in Sydney, however, Thurston was unable to land the conversion. The retiring Cowboys No.7 was then involved in more drama, with John Asiata moments later sin-binned for a professional foul in interfering with the Sharks’ attack while well offside. A frustrated Thurston told referee Matt Cecchin the call was “bulls***” before the Sharks crossed for two more late tries. In his third-last NRL game, Thurston gave the last-placed Cowboys’ NSW-based fans one last glimpse of his brilliance when he put on North Queensland’s only first-half try with an out-the-back flick pass for Coen Hess. The win kept Cronulla sixth on the NRL ladder with two games to play but only behind Penrith and St George Illawarra on for-and-against and with two bottom-eight teams to play. However it came at a loss, with centres Jesse Ramien (ankle) and Ricky Leutele (knee) both leaving the field and not returning. Halfback Chad Townsend was particularly good in attack, just weeks after there had been calls for his head following the Sharks’ loss to Brisbane in round 20. After Cronulla went to the break at 6-6, Townsend had his fingerprints all over the Sharks’ go-ahead try eight minutes into the second half. The No.7 pressured Te Maire Martin into an error when chasing through on a bomb before stepping over to score on the next play. He’d earlier put Luke Lewis into a yawning gap for the Sharks’ first try in what was a quieter first half.